If there are aspects of the Passover seder from which all people can learn, how much more so is this true for believers in Messiah? After all, our Master Yeshua chose the wine and the matzah of a Passover Seder to represent his body and blood. More than just learning about and celebrating the concept of freedom from oppression and exile, for disciples of Messiah, the seder celebrates Yeshua’s atoning death and resurrection while remaining firmly grounded and centered on God’s deliverance of the Jewish people from Egypt. There is ample evidence that, for the earliest Gentile believers, the celebration of Passover was an important holiday celebrated by all believers in Messiah—both Jewish and Gentile. Paul wrote the book of 1 Corinthians to a predominately Gentile audience who attended both synagogue and weekly gatherings of believers. Additionally, the timing of the letter seems to have been sometime in early spring before the Passover season had begun. Many portions in the letter allude to Passover and seem to offer instructions for observing it properly with the right heart-attitude. Everything before the story is to prepare for the story. Everything after the story is to celebrate the story. The Leader is the guide on this journey. One of the challenges of the Leader is to keep the participants engaged from beginning to end. All the traditional directions (like covering and uncovering the matzah, for instance) are just devices to help participants, especially children, pay attention and ask: Why? I’m going to need all the advice I can get, especially Rabbi Seinfeld’s, given my memory of last year’s Passover seder. My wife reminded me that it wasn’t my fault that the seder came off so poorly. We had a relative in the hospital and our lives were at least in a mildly emotionally chaotic state. The year before that, my wife and daughter felt rather unappreciated because they believed my sons and I didn’t appropriately recognize the great effort they had put into preparing the meal. Needless to say, Passover has lost some of its appeal in my family. This year, I promised myself I wouldn’t even bring up the topic of Passover. And since there isn’t so much as a feather in sight and sufficient amounts of rolls and bread continue to inhabit our home, I was firmly and calmly resolved to simply passing by Pesach and moving right on to Easter. Then yesterday evening, my wife asked me to go with her to our son’s and his wife’s home for a short visit and she said on the way, we could talk about Monday. What’s Monday got to do with anything? In Boise, Idaho, Erev Pesach candlelighting is at 7:44 p.m. on this coming Monday. When she said that we needed to plan for Monday’s seder, it was like she suddenly said, “I’m pregnant.” Well, maybe it wasn’t quite that shocking, but it still came out of the proverbial clear, blue sky. I never saw it coming. In a way, I was relieved that we weren’t going to celebrate Passover this year, at least as a family. In my quest to return the Torah scroll, so to speak, to my Jewish wife in particular and to the Jewish people in general, I have surrendered a number of practices and observances that I had once held dear, Passover being among them. 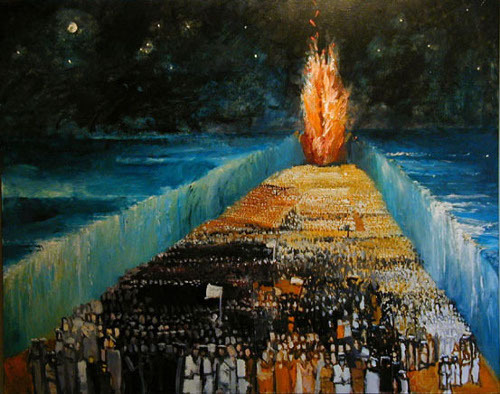 After all, I cannot be considered as one of the members of humanity who marched out of Egypt and left behind my slavery, and certainly I cannot project myself into the masses who stood at the foot of Mount Sinai and personally received the Torah from Hashem, as does every person who is Jewish. So as I processed my wife’s news about our impending family Passover seder, I found myself quickly dusting off Toby Janicki’s advice about Christians and the Passover (though he doesn’t phrase it that way). 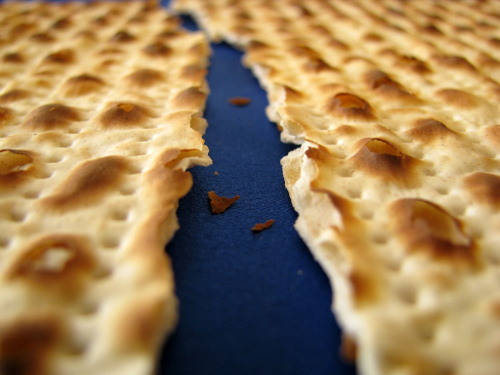 There’s really only one difference between matzah and chametz. They’re both made from flour and water, both baked in an oven, and both provide nourishment. But one stays flat and humble, while the other fills itself with hot air. That’s why matzah is a key ingredient for leaving your personal Egypt: As long as we are full of delusions of self-importance, there’s no way to break out and grow to a new level. Once we make ourselves small, we can fit through any bars and fly past any cloud. On the other hand, as Rabbi Freeman suggests, maybe a healthy dose of humility is a good thing. But as it turns out, Rabbi Seinfeld’s advice won’t do me much good since it seems geared for a seder with lots of kids. My four-year old grandson will be the only child present (guess which child will find the afrikomen?) so the emphasis for the seder will have to go in a different direction. Which direction I have no idea at this point. I’ll need to select a haggadah (after so many years, we have several tucked away in various drawers and cupboards around the house) and practice using it, so my leading doesn’t feel and sound so awkward and forced (and my Hebrew pronunciations are going to be traditionally poor). I suppose if we were an actual Jewish family (in a traditional sense) and we all had grown up celebrating Passover every year, going to other homes where Passover was celebrated every year, and I, as “head of household,” had been leading family Passover seders for the past thirty years or so, it would seem like second nature by now. But it isn’t, especially after “reinventing myself” a couple of years ago. On the other hand, I’m approaching going to my first Easter service in well over a decade with an equal amount of dread if not horror. The one saving grace is that I won’t have to lead a thing…I just have to follow. I wonder where I’ll feel more “alien,” the seder or a sunrise Easter service? But I digress. What am I really complaining about? Being a fish out of water? I’m certainly not afraid of co-opting Jewish identity or position since A) I’m not going to be very good at this, and B) as the husband and father in an intermarried family, it’s actually my place to lead the seder. Maybe I should play it safe and stick to the ABC’s of Passover, keep it simple (stupid), and just try to get by. But Christian/Jewish intermarried couples exist. We’re real. There must be some help out there for us…for me. Well, maybe not. I can find material on intermarriage and Purim, but that’s because at the heart of the Purim story is an intermarried couple. But what about intermarriage and Passover? Being a pessimist on intermarriage is not easy these days. The Jewish community is tired of gloomy reports conveying what Steven Cohen titled “An Inconvenient Truth” in one of the most controversial studies of the last couple of years. The identity chasm between inmarried and intermarried is so wide, he wrote, as to suggest the imagery of “two Jewries.” One group attends Passover Seders in high percentage—namely, the inmarried—while the other, the intermarried, either refrains from doing so or attends these Seders in much lower numbers. What part of that do I as a Christian share, if any? “Either/or” thinking is a sadly limited perspective. For example, it sees only the Jewish religious aspects in Passover and misses the universal message of a redeemer God at the heart of Passover observance. Non-Jews who had sanctified themselves to the LORD were welcome to celebrate Passover, to eat unleavened bread and to give thanks to the LORD for His goodness. Gentiles, along with Jews, were welcome to the Lord’s table to eat the matzo and rejoice in the mercy of God. Followers of Y’shua (Jesus) see the message of the deliverer God prominently emphasized within the Passover story. All this still has me feeling small and inadequate, and while not relative to Passover, I guess I’m not the only one. The following has nothing to do with Passover but everything to do with feeling small. I celebrated my first Passover in 1979, I was 19. I believe that I have celebrated Passover every year since, although, there have been times when I have done “Passover lite” in which I grabbed a friend (and her house) and held a very quick Passover. But for some reason, I kept celebrating. 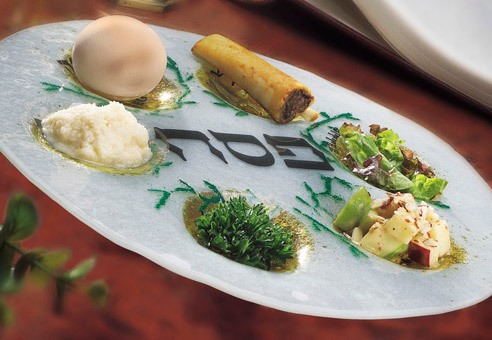 To me, Passover isn’t just for the Jewish People. It’s for gentiles as well. This is the time when we celebrate the Great Passover Lamb, who brought us out of slavery to sin, and brought us into the freedom of the Kingdom of the Beloved Son. It’s the time when we remember the miracles it takes to get us out of slavery. It is time to remember that only by the mighty Hand of God can we be saved, healed, and made into a people with whom God can dwell. There is no freedom without a miracle. There is no life save by the mighty Hand of God. ..and if I don’t get off the computer and get my house clean, I’m going to need another miracle…Life goes on. I don’t doubt what you’re saying, but “rewiring” my understanding of Passover in relation to my family is another thing entirely. I’m forced to confront my inadequacies with the seder, the Hebrew, the raw “Jewish identity” of Pesach, as well as my Master, the Messiah. LOL. That much is true. Good Shabbos, my friend. Thanks for the encouragement, PL. Also Christians should celebrate 14 and 15 Nisan and make the Pesach the most important feast of the year. Several Christian denominations who celebrate Easter and have kids looking for chocolate eggs, which came from church-bells, and putting up Easter bunnies, should stop doing such heathen actions and take distance from the feast of Easter for the goddess of fertility, Estra.